Crocosmia (Crocosmia masoniorum) - encourages you to playfully engage your emotional strength, power and will to express yourself confidently with enthusiasm. I AM confidence radiating out in all directions. Crocosmia is native to tropical and southern Africa and is related to freesia. 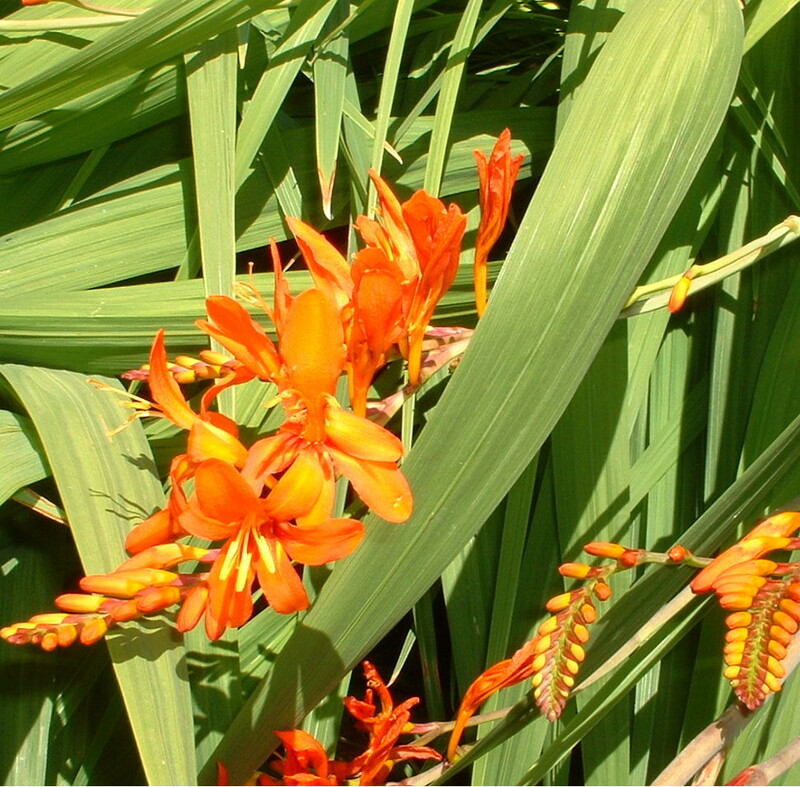 Drought tolerant crocosmia grows from corms, has sword-shaped leaves from basal clumps and brilliant orange–crimson flowers on long arching stalks. It is a striking garden perennial and the long leaves provide mulch and cover for small birds and other critters during the winter. Lack of confidence. Whining about how hard thing are and blaming circumstances for not being able to accomplish what you want. Conversely, trying too hard to act confident which may lead to becoming overly serious. Difficulty speaking confidently from your personal power around other people. Crocosmia Flower Essence encourages you to playfully engage your emotional strength, power and will to express yourself with confidence. It’s relaxing quality invites you to be in your body and to pour out - radiate out - your strength, power and will with enthusiasm to encourage others to engage and radiate theirs. Speaking with confidence doesn’t come solely from the throat chakra. It comes from sensing your emotional strength, power and will from the sacral chakra. Crocosmia Flower Essence harmonizes both the front and back of the throat chakra and primarily the back of the sacral chakra. Crocosmia Flower Essence was made by the no-pick method of working directly with the plant spirit. While the essence was being made a matrix of amber, aragonite (brownish orange starcluster), blue calcite, citrine (heat treated), drusy quartz, icosahedron quartz, shattuckite, and tangerine quartz were placed among the plants with the storage (mother) bottles. The sun acts as a transformer to step down spiritual energies from higher dimensions. While the essence was being made, Amber acted as a lens to receive and focus sunlight for this purpose. It also aligns the subtle bodies with the physical bodies, transmutes negative energy into positive energy, and emits a sunny and soothing energy that calms and enlivens the disposition. Aragonite (brownish orange starcluster) radiates energy outward in many directions creating a web of Light throughout the energy systems, promoting a sense of peace. Heals the emotional body and aligns you with love. All chakras. Blue calcite soothes nerves and promotes rest and relaxation while surrounding you with blue spiritual light. It releases stress and helps you feel more empowered in your life. Throat chakra. Citrine (heat treated) lightens dark thoughts and brings optimism, playfulness and optimism into your energy systems. It empowers your ability to make clear decisions and your will to take action. Drusy Quartz crystals help to energize and stabilize your subtle bodies. Icosahedron cut quartz has 20 (5X4) equilateral sides. It is a bridge between the 5th Dimension - the entry into the unified Spiritual realms - and the 4 cardinal directions (N, S, E, W) on Earth. Shattuckite is a calming and soothing stone that aligns you with speaking truth through your actions. Throat chakra. Tangerine quartz helps you to engage your will aligned with playfulness, curiosity, creativity and joyful enthusiasm. Sacral chakra. While the Crocosmia Flower Essence was being made imprints of rattle and spirit song coming through Diana’s voice were infused into the essence.